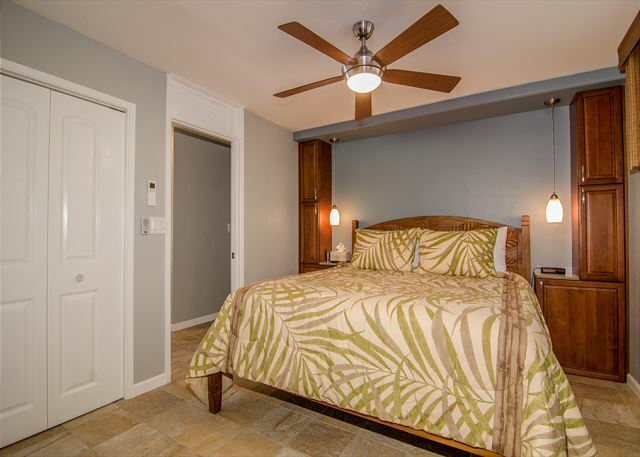 This newly remodeled oceanfront condo located right in the heart of Kailua Kona has everything you need to make your vacation complete. This one bedroom is fully furnished with snorkeling gear, boogie boards and a kitchen that is a chefs delight. A king size bed in the bedroom and a fold out tempurpedic Queen bed in the living room make this condo a vacationers delight. 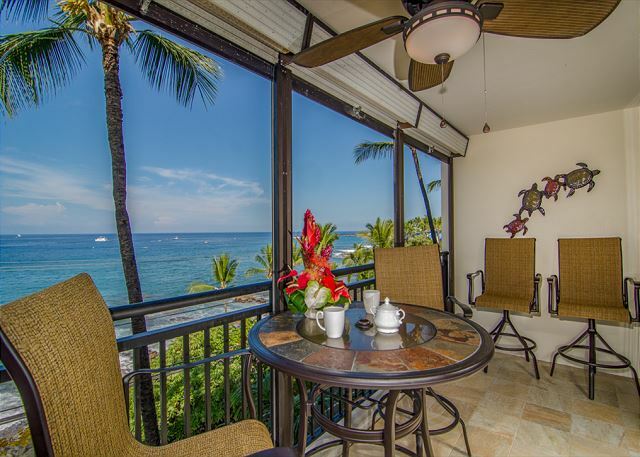 A lanai that overlooks the bay so you can dine watching the sunsets or enjoy sipping a cup of Kona Coffee while watching dolphins and whales splashing around right in front of you. This unit can be rented with AC at an additional charge of $15 per day, please inquire with a reservation agent. Conveniently located in the heart downtown Kailua Kona. Explore downtown historic Kailua Kona. The town of Kailua Kona "hides" some very important Hawaii Island historic spots. Both the Hulihee Palace and the Mokuaikaua Church are located on Alii Drive. King Kamehameha I spent his last years living near the current site of the King Kamehameha's Kona Beach Hotel until his passing in 1819. The Ahuena Heiau, located on the grounds of the hotel, is a reconstructed temple rebuilt by Kamehameha himself and is on the register of National Historic Landmarks. 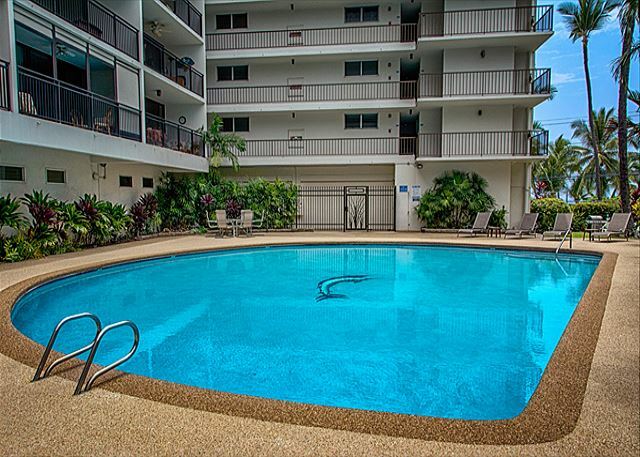 Kona Alii is conveniently located, a great home base to explore the many wonders of the Big Island of Hawaii including the Volcano National Park, Mauna Kea Observatory, coffee and macadamia nut farms, artist communities, and more! Unit should have been cleaner. Obviously, cleaned very quickly. Any issues we had were handled well by Nick, at Boundless. Overall, a very nice stay. Only hard to ignore the homeless population from this location. Thank you for your review! We are sorry to hear you found the cleaning was not up to par! We have addressed this complaint with the housekeeper to make sure this does not occur again. We sincerely hope to see you again soon. To obtain the very best rates please directly contact our property manager, Nick. Just as advertised, a wonderful place to stay! I have read all the prior reviews and it appears there is really little I can add. A great location, a great condo, great amenities, and agreat all around experience. You won't be disappointed. Thank you for posting this 5 star review of your experience at the property! We are happy to hear you had a beautiful stay with an excellent location. Thank you. We sincerely hope to see you guys again soon. Simply remember that the best possible rates are found directly through Boundless Hawaii. It's our second time staying in this condo. We like the convenient location and ocean view. The kitchen is stocked with everything you'd need and there's plenty of towels and supplies. Lots of beach towels and a boogie board too! Aloha and thank you for the 5 star review. We are happy to hear you are a returning guest and once again enjoyed your stay. Hope to see you again soon. 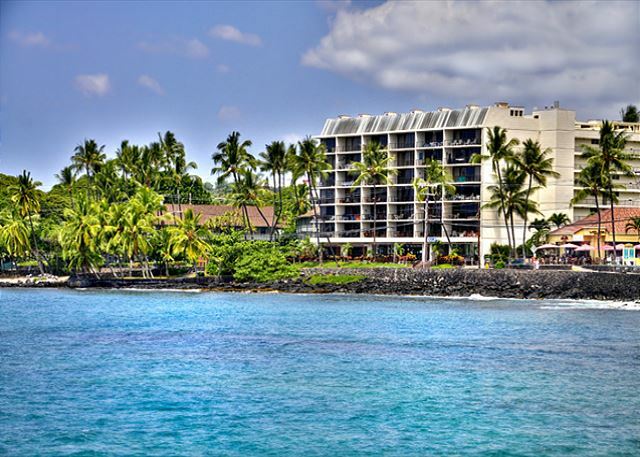 Please remember to book directly with Boundless Hawaii for the best available rates. My stay was excellent, the home was beautifully set up and had everything we needed to just walk in with our suitcases and enjoy the week stay. The beach items were an unexpected surprise and were used daily. If I am ever blessed enough to go again, I would stay here! I will also recommend this place to friends. Thank you for the wonderful review. We are so happy you enjoyed your stay and took advantage of the beach items. We would love for you to come visit us again soon. Please remember to book directly with Boundless Hawaii for the best available rates for you and your friends. Aloha! This is a wonderful condo. The recent top to bottom renovation was extremely well executed. New floor tile throughout, new cabinets and granite countertops, new plumbing and electrical and all new furniture make for an amazingly comfortable stay. It’s spotlessly clean as well. 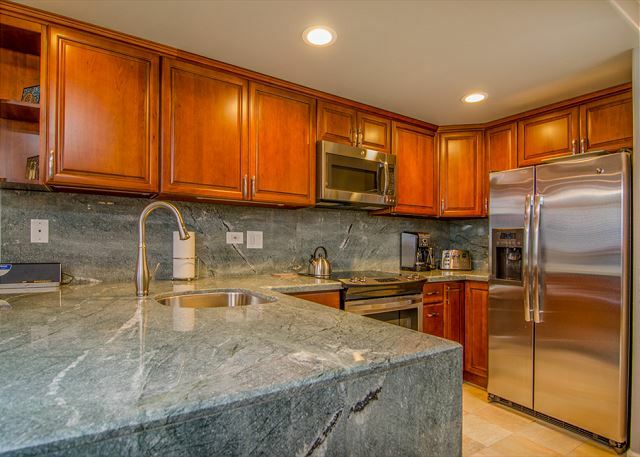 The kitchen is fully stocked with every appliance and utensil you can imagine. Just when I would say “I wonder if there is a....” there it was in a drawer or a cabinet. Our 6’1” fifteen year old son stayed on the pull out couch and said it was very comfortable and he slept really well. The condo is right on the water and though there is the main drag right in front people are driving by very slowly and the crash of the waves from the ocean are louder than any vehicle noise. 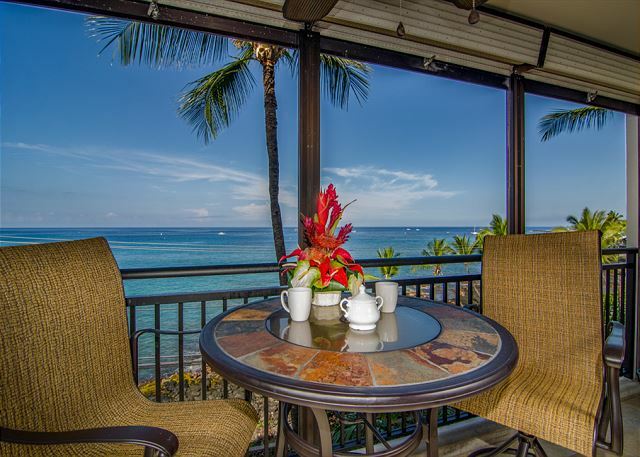 The lanai has amazing views of the sunsets and sitting there with our morning coffee each day was also a highlight. The pool is recently renovated and was spotlessly clean with two BBQ’s just around the corner. This whole building is very well maintained. Location couldn’t be better with dozens of restaurants within several blocks. The walk along the water is also a great way to spend some time. I would highly recommend this condo and location for a wonderfully comfortable stay. 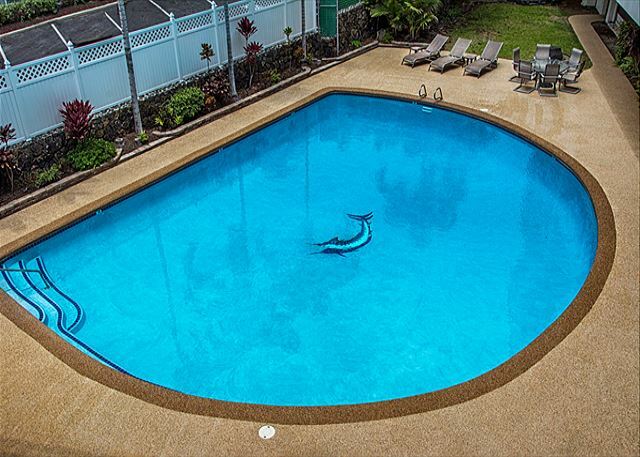 Gary we thank you for such a detailed review of your experience here on the Big Island! As you mention the property was recently remodeled with future guests in mind, wonderful to hear those changes made your stay unforgettable! We sincerely hope to see your group again soon. Simply remember that the best possible rates are found directly through Boundless Hawaii. This condo was wonderful for our first visit to the Big Island. Check in was simple and exactly as per the instructions provided. The condo was equipt with everything we could possibly need for our stay. 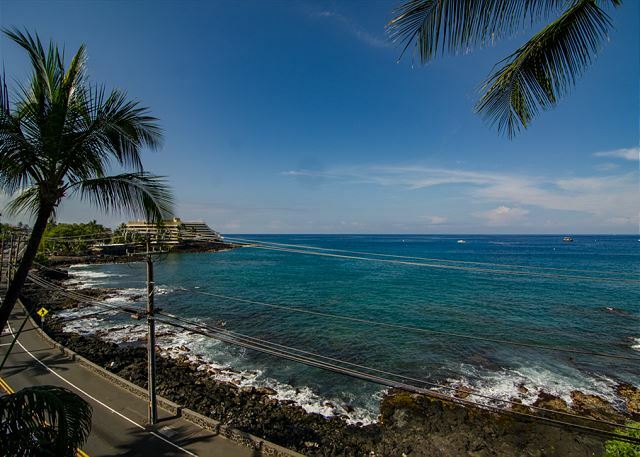 Location was perfect, ocean views and right along the main street in Kona. Plenty of towels / linens for our stay and the cupboard full of body boards/ beach chairs etc also came in handy. We were also accommodated with our request for a late check out on very short notice. Would stay again and would strongly recommend to anyone else staying on the Big Island. We thank you for posting this 5 star review of your experience at the property! We'd love it if you returned, don't forget return clients are entitled to a 10% returning client discount! 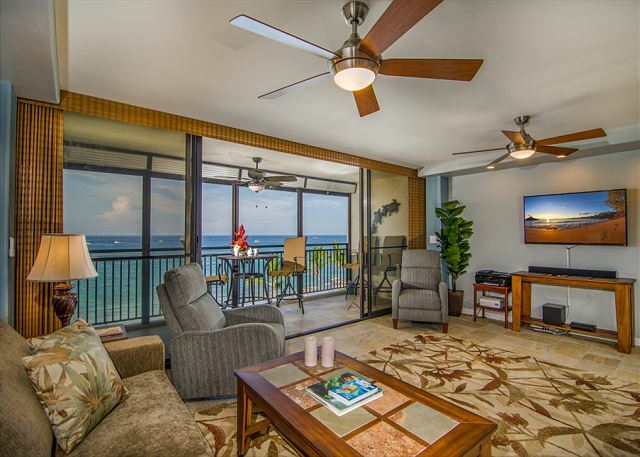 Outstanding condo unit, well appointed and the view off the lanai was spectacular. We could watch the people on Ali'i and the waves too. Mahalo Tom! We are so happy to hear you enjoyed the stay with us! We encourage you to return and take advantage of the returning client discount. This is a lovely unit, however, staying for several weeks, it would be nice to have a bit of storage in this condo. There are very few drawers or cupboards large enough for storing a pillow or blanket. The dresser drawers were filled with linens. The only closet is jammed with cleaning supplies, body boards, beach chairs, ironing board, ice chests, and the vacuum cleaner! It is hard to get to the hanging clothes. This unit is nicely appointed and the bed is great. Showers are both nice. Having two sinks in both bathrooms is a treat. Overall, comfortable. Thank you for taking the time to review your experience with us! As for the closet space, we apologize that the closet space is not sufficient for a guest staying as long as you had this year. For the average guests they find the beach gear more beneficial then a bit of added space in the closet. We look forward to your stay next year! This was a great choice. Traffic can be very hectic in Kona so being able to stay in a location where you can walk to everything is very important. One of my favorite VRBO stays. Thank you for the excellent rating! We love hearing our guests enjoy their accommodations! 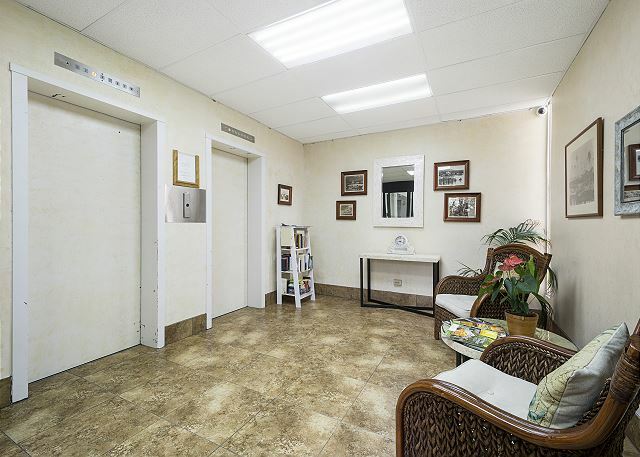 Convenient location, nicely remodeled comfortable unit! After having some trouble getting into the condo(both numbers given to us were incorrect for the lockbox & door keypad) we were happy to get settled into this lovely unit. It had everything we needed, super clean and was very comfortable! The first day the washer locked and wouldn’t open- it was the weekend but they came first thing Monday after we called to fix it which was much appreciated! The location was fantastic!! We walked to dinner every night and enjoyed the shops. Heavy construction directly out front was a a bit of an eye sore and was really really loud mid day. Our kids enjoyed the pool although it was very cold. Overall a good stay!! Thank you for taking the time to review your stay with us! I am sorry about the initial confusion with your check-in procedures, and the malfunction of the washer. Hopefully you will return to Kona and consider Boundless Hawaii in doing so you'll receive a 10% discount! We stayed here for the Hawaii Ironman. It’s in the perfect spot within walking distance to everything. You can’t beat the beautiful view of the Pacific. The AC was well worth the extra charge and nice to have that option. It was updated and very clean. The Boundless Hawaii staff were quick to respond for anything we needed. Mostly when upon our arrival I got mixed up on the door codes! It was after 8 pm and someone was there for us! Hope to come back and stay here again! Thank you for your kind response. We are happy that you enjoyed your visit with us. The Ironman World Championships are an exciting event for everyone and we are proud to play a small role in that experience for our guests. We welcome you to come back and visit us again! As a returning guest you are eligible for a 10% discount on your next booking with Boundless Hawaii. Mahalo! Fabulous apartment beautiful position and views to take home forever! Everything available to make the stay comfortable from beautiful bed to well appoi ted kitchen. Mahalo for visiting with us for your annual trip to Kona for the Queen Liliuokalani Canoe Race! We would be happy to host you again next year!!! Kona Alii is located next door to Lava Java, coffee house turned real restaurant, located on Alii drive in downtown Kona. A great spot for "anyone" who enjoys fun and great restaurants. 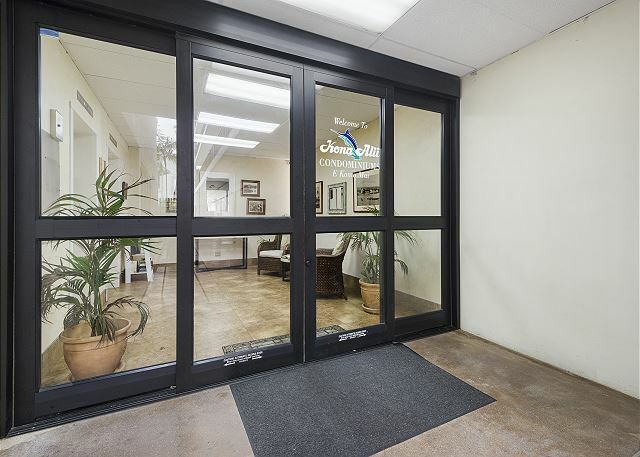 403 is located on the 4th floor and faces the ocean, right on Alii Drive. Walking distance to everything you need. Condo was neat, clean, and was supplied with all amenities you would have at your own home.Closet space was the only part a little lacking. 1 closet only for any "hangup" clothes. This assortment of condos also has an elevator. Saves time & body on move in and move out days. Covered parking helps also from the hot sun.We are coming back next year for another 4 weeks, in April. Aloha and thank you for your thoughtful review! We look forward to your return visit. I was sick when we arrived and needed to take the time to Recuperate. The dark clouds the first few days made me feel cozy and safe! The warm breeze coming in from the lanai side of the condo lulled me to sleep. I work and run all year so this was a needed time... I found the condo and location to be perfect! Boundless Hawaii was the best company to work with. Professional, kind and very available. I left home behind and found a new one ! Aloha, Thank you for taking the time to provide such lovely feedback. We are so happy that you were able to relax and enjoy your visit! We would love to have you back. Remember, returning guests receive a 10% discount on reservations made directly through Boundless Hawaii. Very relaxing and fun. We enjoyed every minute of our time in Kona. Our space was perfect for us. Thanks for a great vacation. We have stayed in three different units in this building and #403 is by far the nicest, most comfortable unit. 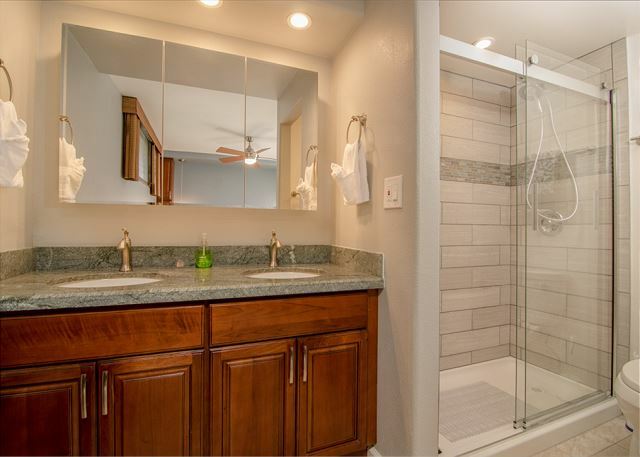 The furniture is tasteful and very comfortable, the kitchen has everything you need and having a washer and dryer in the unit is so convenient. Everything you need for the beach is also available to you including beach chairs, umbrella, ice chest, etc. The ocean views are unbelievably beautiful and we left the sliding doors wide open all day and night. The location in town couldn't be any better and it was so easy to walk to restaurants and shopping. We will definitely be back! Aloha, we would be happy to have your return! Remember, returning guests will receive a 10% discount off of direct bookings! Location, location, location! We loved the view and sounds of the ocean. We also loved how close it was to town and that we didn't need a rental car. Everything was close by but it was still quiet at night. Well maintained unit. The only minor flaw was how long it took to get hot water going in the shower. We would stay here again in a heartbeat. Must give this property A in every respect! Well located in the middle of everything. Clean and everything worked. The bedroom window does open onto the corridor and people walking around outside the unit making noise can disturb, but that did not happen often to us.We were staying for 15 days and on day 2 and 3 the dispenser in each of the two bathrooms ran out of body wash and conditioner, which means no one checked it before we arrived. I did call the management company and they did not make an effort to come out and refill the dispenser. That was disappointing. View is THE BEST! Could not take my eyes away from the water, morning and night! I was in Kailua Kona on business, but this stay made it feel a bit like a vacation. Sleeping and waking with the sound of surf and the ocean breeze was a pleasure. One downside: the bedroom is cramped and has glare from the exterior lighting at night - I slept in in the living room. Couldn't have found a better condo! We were blown away by how beautiful this condo is. 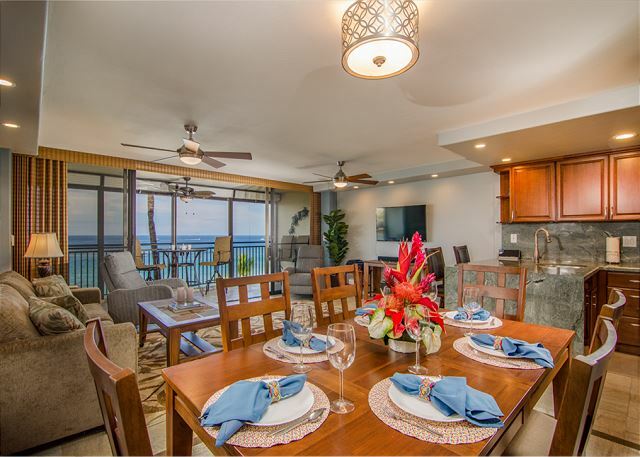 Right when you walk in you see the HUGE patio to your right and the gorgeous ocean views! We looked forward to early mornings with our coffee, and sunsets with wine every single day. The condo was outfitted with every thing you could think of! Beach towels, boogie boards, very nice umbrella and beach chairs, 2 coolers, ice packs in the freezer, first aid kit, wine glasses etc, very thoughtful, we hardly needed to bring a thing! The washer and dryer were excellent. Bed very comfortable. The condo is literally in the middle of everything! 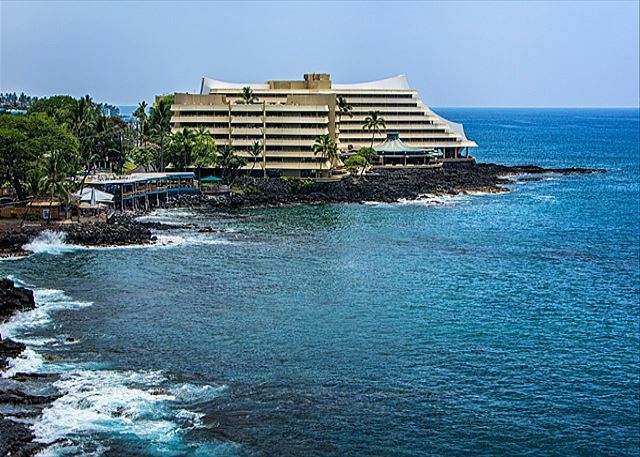 dozens of restaurants, bars, endless shops, the harbor, kona brewing company etc. We walked everywhere. We thought this was our best vacation ever. We can't wait to return! Good location, excellent size, very comfortable. Really appreciated all the little extras in the kitchen - very helpful. 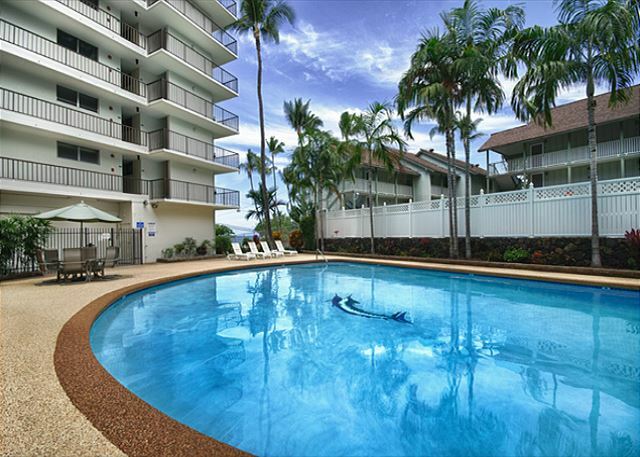 Kona Alii 403 had just recently been completely remodeled and was REALLY nice. Near to everything, great restaurants, the pier for sightseeing trips and just across the street from the ocean--the surf was beautiful to watch.